I'd like to walk you through tonight's forecast for Irene. The damage potential is huge. Even if the "best case" occurs, I believe the damage may be north of $10 billion. For North Carolina's coast a hurricane warning is in effect. It looks likely that the eye of the storm at Category 3, or possibly 4, will come ashore in the Tar Heel State. Massive damage will occur if the storm is Cat 4. Please rush hurricane preparations to completion and follow local evacuation orders. Farther north, things are coming into focus but are not as clear cut. Here is the westernmost computer model. Winds of more than 120 mph will move in North Carolina with hurricane-force winds along the coast as far north as northern New Jersey and inland to Richmond-DC-Hagerstown. Colors = wind speeds with reds hurricane force and whites above 100 mph. 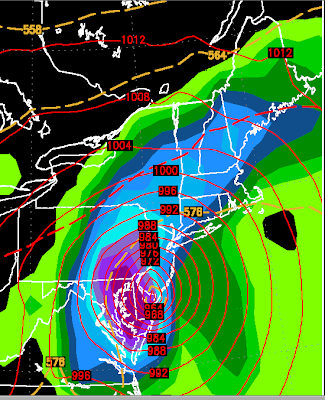 Here is one of the models indicating a more easterly track. 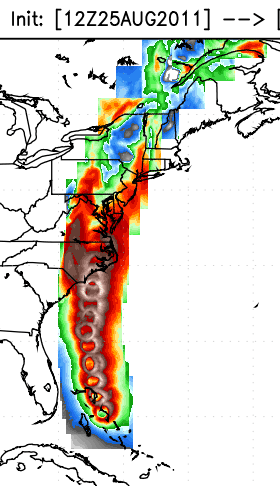 North Carolina will still experience hurricane-force winds with lots of damage over the Outer Banks. Winds of 85 mph or stronger will occur from Long Island into southeast Massachusetts (similar to Hurricane Bob). and then across New York Harbor 6 hours later. This is the worst case scenario. Winds of 90-100 mph (with higher gusts) will around Newport News, the mouth of the Chesapeake, and Delmarva with 80-100 mph winds across New Jersey. 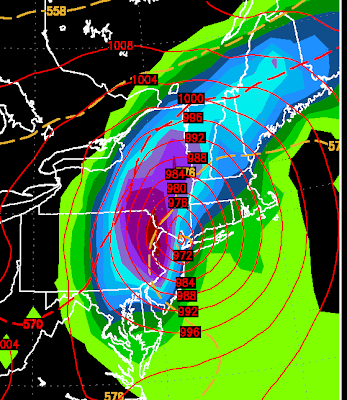 New York City, at ground level, will have winds of 70 to 90 mph. However, above about the 20th story of buildings, winds will gust well above 100 mph. More on that in a minute. So, you now have seen the western, most likely, and eastern scenario. None of them are good. So, these latest storms are helping keep the ground saturated ahead of the approach of Irene. 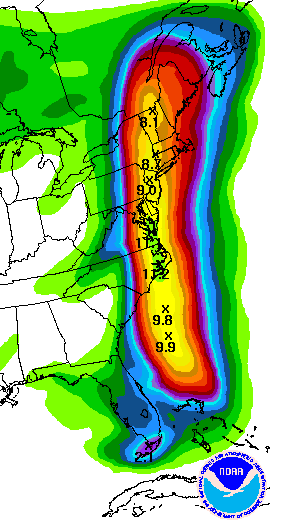 Here is the forecast rainfall associated with the hurricane. Because of the wet ground, it will be easy for the hurricane to uproot trees which will bring down power lines as they fall. So, regardless of the exact path of the storm, trees will topple causing extensive power failures. Those power failures will last more than a week in a number of areas. In addition, the difference in wind speed between the ground and the top of skyscrapers makes glass damage especially likely. Storm surge will exceed 10 ft. in some areas causing coastal flooding and river flooding will likely occur as a result of these heavy rains. 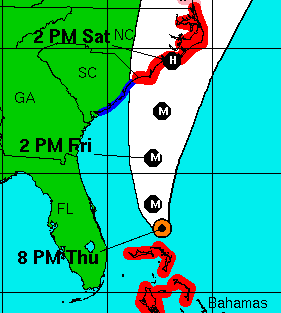 This hurricane will be a big deal if it follows the "worst case" path and will be a medium to big deal regardless. If you are told to evacuate, do so. 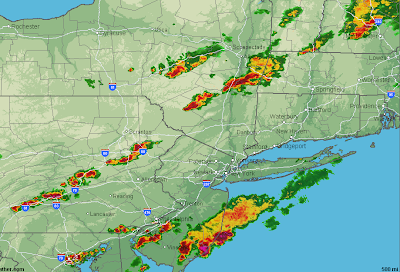 Other factors equal, you will want to get west of I-95 into central PA (or points west), Upstate NY, etc. More than 1,000 electrical crews are already in the area and more are staging outside the path of the storm. Regardless, there will be extensive and long-lived power failures (more than five days) in a number of areas. Those electrical crews will work in difficult conditions and under a lot of pressure. So, in an advanced salute to those crews, I present Glen Campbell's greatest song. If you lose power, please report it right away then be patient. I'll have another complete update tomorrow morning. And, if you are new to the blog there are checklists, reading materials, and lots of useful information. Please scroll up and down. "...trees will topple causing extensive power failures. Those power failures will last more than a week in a number of areas." I don't doubt that trees will topple and power will be knocked out in a number of places, for that and no doubt other reasons. But on what basis do you say the outages will be more than a week, and what areas do you have in mind? You made a very specific, and upsetting, prediction so it would be nice if you fleshed it out a bit. Hurricane Bob, which moved a little farther east than Irene is predicted to move, caused power outages of 10 days to two weeks. And, in those days, utilities had more crews than they do today. So, since this hurricane is similar intensity and will affect more people (it is a geographically larger storm) if they could not get the power restored in a day or two with Bob, there is no reason to believe they will do so with Irene. Based on their statements, the utilities agree with me. Fortunately, it is not winter. So, we a little planning, you can wait it out if you are in an area with an extended outage. I have posted my tips for doing that three times since Sunday. Just scroll down. Good luck with the storm! !